Christian Dior’s creative director Maria Grazia Chiuri has done wonders with this Dior Fall 2019 collection to celebrate the beauty, wonder, and prowess of women worldwide. The show begins with a heartfelt Italian poem read by Tomaso Binga about female victory over the patriarchy. Solidarity is not a far fetched goal for Dior. It’s a reality. Let’s dive into this powerfully feminine performance with this Paris Fashion Week Christian Dior Fall 2019 Collection review. ‘Sisterhood Is Global’ speaks volumes of Dior’s connection to feminism. There are many classic elements here: the long skirt, the plaid pointed heels, and the studded pearl choker. These choices mesh well with the rock-n-roll vibe of the leather belt and veiled bucket hat. This look shares similar details as the first. The bucket hat and the thick belt re-emerge, but there is a departure in styling from modern to old fashioned. Elegantly layered beneath a ruffled button up collar, the sweetheart neckline is a defining point of the ensemble. Chic and sweet, this suit dress looks like it could be the required uniform of some expensive British private school. The suit is smart and the folded pockets add roundness to the shape. Reflective sunglasses, a CD clutch, and patent leather shoes bridge the gap between modern and antique. Conflicting components work to form a cohesive piece. Multicolored plaid fashions into structured, slightly militant lines that buff against the comfortable quilted construction of the pants. Strappy, embellished green heels finalize the look with a lady-like air. Coupling a leopard-print bucket hat with a gorgeous formal skirted romper is extremely unconventional. 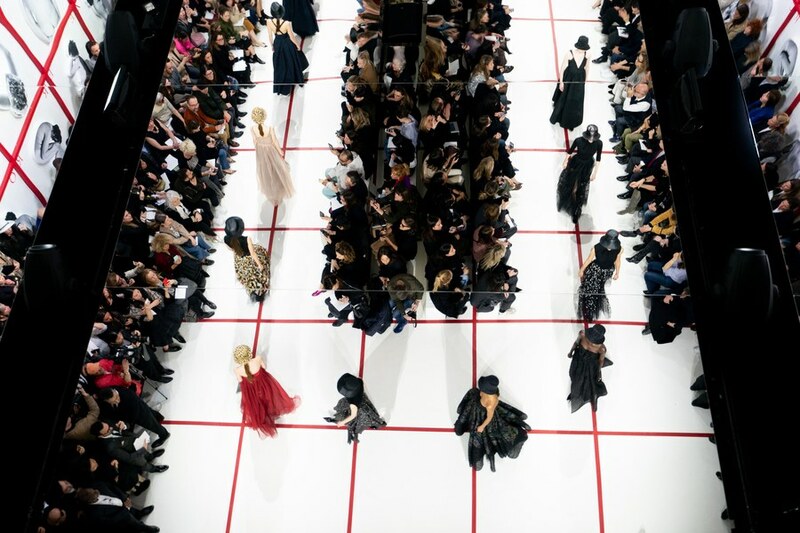 Dior is known, however, for innovation and evolution that deviates from the norm. Black tulle is woven beneath the scarlet creating a vibrant contrast in tone. If you’ve enjoyed this review, read our latest Fashion Week reviews on Fendi and Prabal Gurung. Explore all of Alley Girl’s Fashion Week posts here.